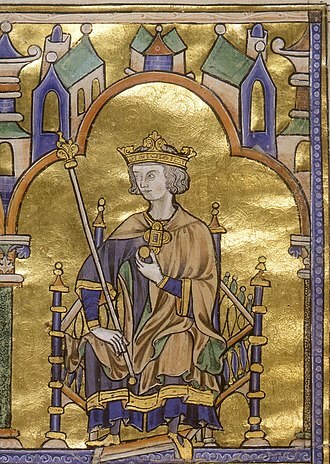 Louis the Stammerer was the King of Aquitaine and the King of West Francia. He was the eldest son of emperor Charles the Bald and Ermentrude of Orléans, Louis the Stammerer was physically weak and outlived his father by only two years. He succeeded his younger brother Charles the Child as the ruler of Aquitaine in 866 and his father in West Francia in 877, in the French monarchial system, he is considered Louis II. The pope may have offered him the imperial crown. Louis had relatively little impact on politics and he was described a simple and sweet man, a lover of peace and religion. In 878, he gave the counties of Barcelona and his final act was to march against the invading Vikings, but he fell ill and died on 9 April or 10 April 879, not long after beginning this final campaign. On his death, his realms were divided between his two sons, Carloman II and Louis III of France, during the peace negotiations between his father and Erispoe, duke of Brittany, Louis was betrothed to an unnamed daughter of Erispoe in 856. Carloman II might refer to the second Carolingian of that name, otherwise known as Carloman I. Carloman II, King of West Francia, was the youngest son of King Louis the Stammerer and Ansgarde of Burgundy, initially some Frankish nobles advocated electing Louis III as the sole king, but eventually both brothers were elected kings. Meanwhile, the powerful Duke Boso of Provence had renounced his allegiance to both brothers and had been elected King of Provence, in the summer of 880 Carloman and Louis III marched against Boso, took Mâcon and the northern parts of his realm. Despite receiving help from their cousin Charles the Fat, who ruled East Francia, only in the summer of 882 Vienne was taken after being besieged by Richard, Count of Autun. After the accidental death of Louis III in August 882, Carloman II became the king of West Francia. The kingdom was in a condition partly owing to repeated incursions from the Viking raiders. Carloman II died while hunting on 12 December 884 and was succeeded in the throne by his cousin and this article incorporates text from a publication now in the public domain, Hugh, ed. Childeric III was King of Francia from 743 until he was deposed by Pope Zachary in March 751 at the instigation of Pepin the Short. Although his parentage is uncertain, he is considered the last Frankish king from the Merovingian dynasty, once Childeric was deposed, Pepin the Short, who was the father of emperor Charlemagne, was crowned the first king of the Franks from the Carolingian dynasty. In 718, Charles Martel combined the roles of mayor of the palace of Neustria and mayor of the palace of Austrasia, after the death of king Theuderic IV in 737, the throne remained vacant, and Charles Martel became de facto king. After Charles Martels death in 741, Carloman and Pepin the Short, his sons by his first wife Rotrude, they soon faced revolts from their younger half-brother Grifo and their brother-in-law Odilo, Duke of Bavaria. These revolts may have played a part in their decision to fill the throne with a Merovingian king after a vacancy to add legitimacy to their reigns. Childerics parentage and his relation to the Merovingian family are uncertain and he may have been either the son of Chilperic II or Theuderic IV. Childeric took no part in business, which was directed, as previously. Once a year, he would be brought in an ox cart led by a peasant and preside at court, after Carloman retired to a monastery in 747, Pepin resolved to take the royal crown for himself. 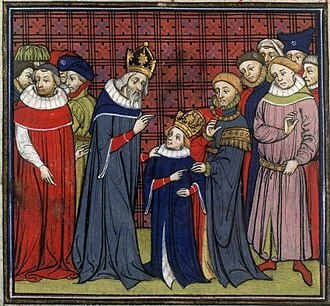 Pepin sent letters to Pope Zachary, asking whether the title of king belonged to the one who had exercised the power or the one with the royal lineage, the pope responded that the real power should have the royal title as well. 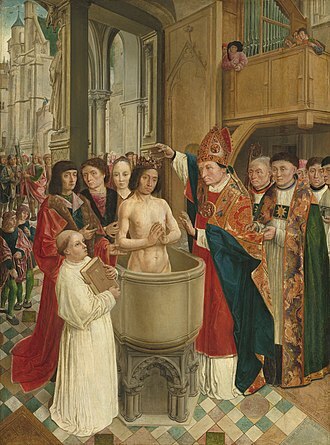 In early March 751 Childeric was dethroned by Pope Zachary and tonsured and his long hair was the symbol of his dynasty and thus the royal rights or magical powers, by cutting it, they divested him of all royal prerogatives. Once dethroned, he and his son Theuderic were placed in the monastery of Saint-Bertin or he in Saint-Omer, there are conflicts in information of when he exactly died with some references citing as early as 753 and other references saying it was as late as 758. Under the Carolingians, he received bad press, being called a rex falsus, false king, despite the fact that it was Pepin through Popes Zachary, junghans, W.
Philip IV, called the Fair or the Iron King, was King of France from 1285 until his death. By virtue of his marriage with Joan I of Navarre, he was Philip I, Philip relied on skillful civil servants, such as Guillaume de Nogaret and Enguerrand de Marigny, to govern the kingdom rather than on his barons. Philip and his advisors were instrumental in the transformation of France from a country to a centralized state. 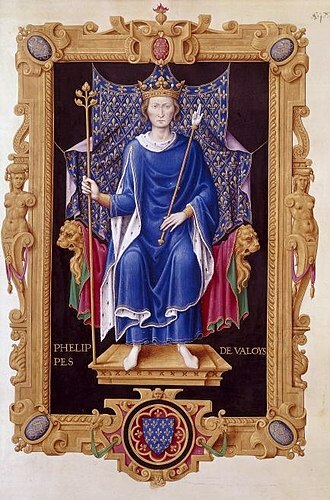 Philip, who sought an uncontested monarchy, compelled his vassals by wars and his ambitions made him highly influential in European affairs. His goal was to place his relatives on foreign thrones, princes from his house ruled in Naples and Hungary. He tried and failed to make relative the Holy Roman Emperor. He began the advance of France eastward by taking control of scattered fiefs. 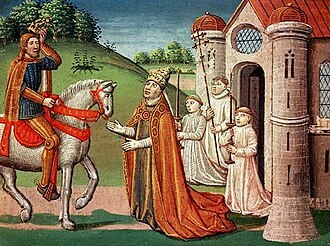 To further strengthen the monarchy, he tried to control the French clergy and this conflict led to the transfer of the papal court to the enclave of Avignon in 1309. In 1306, Philip the Fair expelled the Jews from France and, in 1307, Friday 13th, Philip was in debt to both groups and saw them as a state within the state. Dagobert I was the king of Austrasia, king of all the Franks, and king of Neustria and Burgundy. He was the last king of the Merovingian dynasty to wield any real royal power, Dagobert was the first of the Frankish kings to be buried in the royal tombs at Saint Denis Basilica. Dagobert was the eldest son of Chlothar II and Haldetrude, Chlothar had reigned alone over all the Franks since 613. In 623, Chlothar was forced to make Dagobert king of Austrasia by the nobility of that region, the rule of a Frank from the Austrasian heartland tied Alsace more closely to the Austrasian court. Dagobert created a new duchy in southwest Austrasia to guard the region from Burgundian or Alemannic encroachments, the duchy comprised the Vosges, the Burgundian Gate, and the Transjura. Dagobert made his courtier Gundoin the first duke of this new polity that was to last until the end of the Merovingian dynasty, upon the death of his father in 629, Dagobert inherited the Neustrian and Burgundian kingdoms. His half-brother Charibert, son of Sichilde, claimed Neustria but Dagobert opposed him, brother of Sichilde, petitioned Dagobert on behalf of his young nephew, but Dagobert assassinated him and gave the Aquitaine to his own younger sibling. Charibert and his son Chilperic were assassinated in 632, Dagobert had Burgundy and Aquitaine firmly under his rule, becoming the most powerful Merovingian king in many years and the most respected ruler in the West. In 631, Dagobert led three armies against Samo, the ruler of the Slavs, but his Austrasian forces were defeated at Wogastisburg, in 632, the nobles of Austrasia revolted under the mayor of the palace, Pepin of Landen. As king, Dagobert made Paris his capital, during his reign, he built the Altes Schloss in Meersburg, which today is the oldest inhabited castle in that country. Devoutly religious, Dagobert was responsible for the construction of the Saint Denis Basilica and he appointed St. Arbogast bishop of Strasbourg. 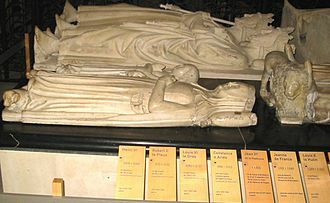 Dagobert died in the abbey of Saint-Denis and was the first Frankish king to be buried in the Saint Denis Basilica, the author of the Chronicle of Fredegar criticises the king for his loose morals in having three queens almost simultaneously, as well as several concubines. Clovis II succeeded his father Dagobert I in 639 as King of Neustria and Burgundy. His brother Sigebert III had been King of Austrasia since 634 and he was initially under the regency of his mother Nanthild until her death in her early thirties in 642. This death allowed him to fall under the influence of the secular magnates, Clovis wife, whose Anglo-Saxon origins are now considered doubtful, was sold into slavery in Gaul. She had been owned by Clovis mayor of the palace and she bore him three sons who all became kings after his death. The eldest, succeeded him and his second eldest, the youngest, succeeded Childeric in Neustria and eventually became the sole king of the Franks. 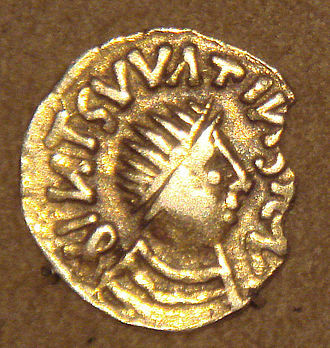 Clovis was a minor for almost the whole of his reign and he is sometimes regarded as king of Austrasia during the interval 656–57 when Childebert the Adopted had usurped the throne. He is often regarded as an early roi fainéant, medieval monks deemed him insane and attribute the stupidity of his descendants to that cause. 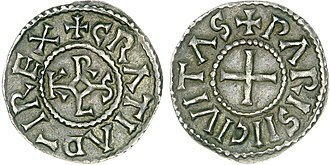 Louis the Pious, called the Fair, and the Debonaire, was the King of Aquitaine from 781. He was King of the Franks and co-Emperor with his father, during his reign in Aquitaine, Louis was charged with the defence of the empires southwestern frontier. He conquered Barcelona from the Muslims in 801 and asserted Frankish authority over Pamplona, as emperor he included his adult sons, Lothair and Louis, in the government and sought to establish a suitable division of the realm among them. In the 830s his empire was torn by war between his sons, only exacerbated by Louiss attempts to include his son Charles by his second wife in the succession plans. Though his reign ended on a note, with order largely restored to his empire. Louis is generally compared unfavourably to his father, though the problems he faced were of a different sort. He was the son of Charlemagne by his wife Hildegard. His grandfather was King Pepin the Younger, Louis was crowned King of Aquitaine as a child in 781 and sent there with regents and a court. Charlemagne wanted his son Louis to grow up in the area where he was to reign, Charlemagnes intention was to see all his sons brought up as natives of their given territories, wearing the national costume of the region and ruling by the local customs. Thus were the children sent to their respective realms at so young an age, each kingdom had its importance in keeping some frontier, Louiss was the Spanish March. 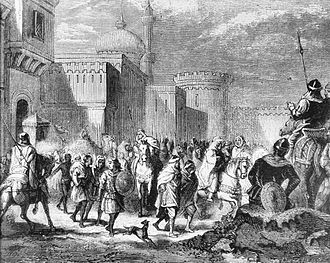 In 797, the greatest city of the Marca, fell to the Franks when Zeid, its governor, rebelled against Córdoba and, the Umayyad authority recaptured it in 799. 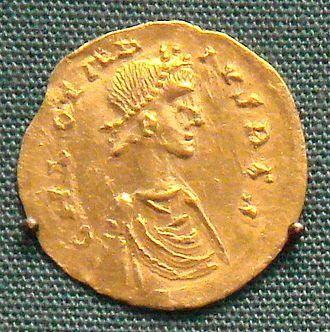 Louis campaigned in the Italian Mezzogiorno against the Beneventans at least once, Louis was one of Charlemagnes three legitimate sons to survive infancy. He had a brother, Lothair who died during infancy. 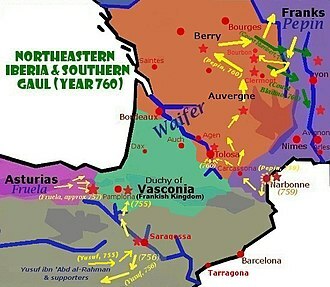 According to Frankish custom, Louis had expected to share his inheritance with his brothers, Charles the Younger, King of Neustria, to Louiss kingdom of Aquitaine, he added Septimania and part of Burgundy. However, Charlemagnes other legitimate sons died – Pepin in 810 and Charles in 811 –, on his fathers death in 814, he inherited the entire Frankish kingdom and all its possessions. Chlothar I, called Clotaire I and the Old, King of the Franks, was one of the four sons of Clovis I of the Merovingian dynasty. Although his father, Childeric I, had united Francia for the first time, in 511 at the age of circa 14, Clothar I inherited two large territories on the Western coast of Francia, separated by the lands of his brother Charibert Is Kingdom of Paris. Chlothar spent most of his life in a campaign to expand his territories at the expense of his relatives. His brothers avoided outright war by cooperating with his attacks on neighbouring lands in concert or by invading lands when their rulers died, the spoils were shared between the participating brothers. By the end of his life, Chlothar had managed to reunite Francia by surviving his brothers, but upon his own death, the Kingdom of the Franks was once again divided between his own four surviving sons. A fifth son had rebelled and was killed, along with his family, Frankish customs of the day allowed for the practice polygamy, especially among royalty. So it was not uncommon for a king to have multiple wives and this was a major deviation from the monogamy of late Roman customs, influenced by the Church. 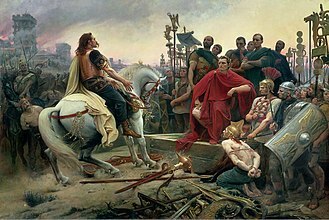 Frankish rulers followed this practice mainly to increase their influence across larger areas of land in the wake of the Roman empires collapse, the aim was to maintain peace and ensure the preservation of the kingdom by appeasing local leaders. In the Germanic tradition succession fell, not to sons, but to younger brothers, but under Salic law, Clovis I instituted the custom of sons being the primary heirs in all respects. However, it was not a system of primogeniture, with the eldest son receiving the vast majority of an inheritance, the greater Frankish Kingdom was often splintered into smaller sub-kingdoms. Chlothar was the son of Clovis I and the fourth son of Queen Clotilde. 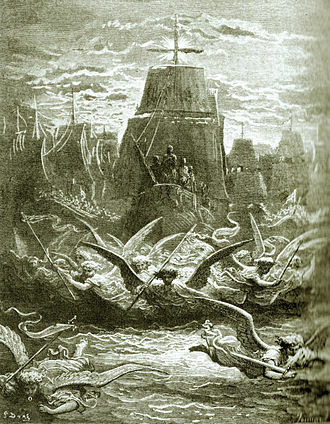 Chlothar was born around 497 in Soissons, but he was very ambitious and sought to extend his domain. Upon the death of Clovis I in the year 511, the Frankish kingdom was divided between Chlothar and his brothers, Theuderic and Chlodomer, because of the rights of mothers, queens were granted a portion of their sons kingdom. 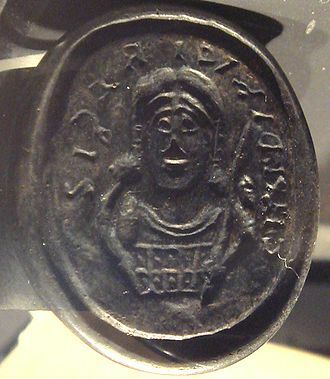 Philip I, called the Amorous, was King of the Franks from 1060 to his death. His reign, like that of most of the early Capetians, was long for the time. The monarchy began a modest recovery from the low it reached in the reign of his father and he added to the royal demesne the Vexin, Philip was born 23 May 1052 at Champagne-et-Fontaine, the son of Henry I and his wife Anne of Kiev. Unusual at the time for Western Europe, his name was of Greek origin, although he was crowned king at the age of seven, until age fourteen his mother acted as regent, the first queen of France ever to do so. 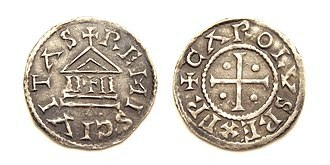 Baldwin V of Flanders acted as co-regent, following the death of Baldwin VI of Flanders, Robert the Frisian seized Flanders. Baldwins wife, Richilda requested aid from Philip, who defeated Robert at the battle of Cassel in 1071, Philip first married Bertha in 1072. Although the marriage produced the heir, Philip fell in love with Bertrade de Montfort. He repudiated Bertha and married Bertrade on 15 May 1092, in 1094, he was excommunicated by Hugh of Die, for the first time, after a long silence, Pope Urban II repeated the excommunication at the Council of Clermont in November 1095. "Throne of Dagobert", bronze. The base, formed by a curule chair, is traditionally attributed to Dagobert, while the arms and the back of the chair were added under Charles the Bald. This throne was last used by Napoleon I in 1804 when he created the Légion d'Honneur. Cabinet des Medailles. A Romantic image (1883) of Eudes regaining Paris by riding through the besiegers. 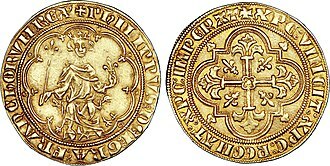 Denier of Odo of France. A treaty of King Chlothar II and the Lombards. 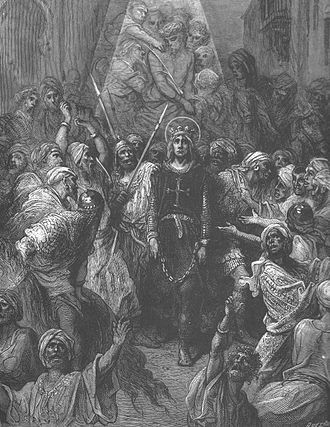 Louis the Pious, contemporary depiction from 826 as a miles Christi (soldier of Christ), with a poem of Rabanus Maurus overlaid. 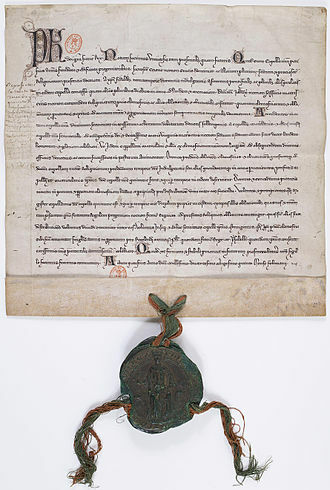 Vatican, Biblioteca Apostolica Vaticana, Codex Reg. 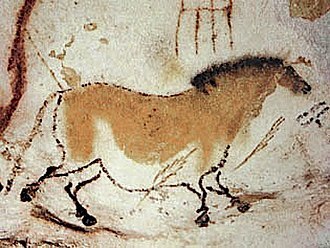 lat 124, f.4v. 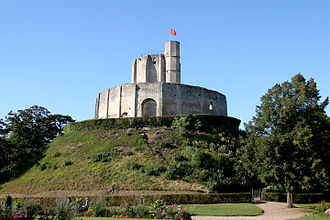 Motte and castle at Gisors. Fictional portrait of Louis VIII. From a series of medals issued by Louis XVIII (19th century). St. King Gontrand and Childebert II, from the Grandes Chroniques de France. Marriage of Sigebert and Brunhilda, Grandes Chroniques de France, from a MS of the fifteenth century (Bibliothèque nationale de France). The assassination of Sigebert by Jean Fouquet, from the fifteenth century Grandes Chroniques de France. 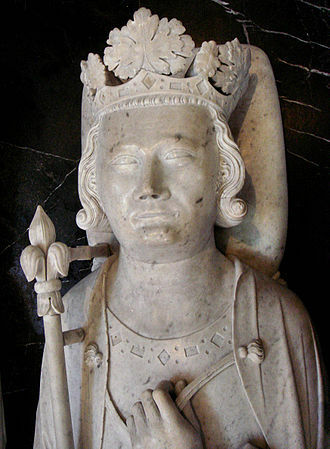 18th century fictional bust of Childéric III by Jean Dassier (1676-1763). King Carloman II oil painting by Charles de Steuben, 1837.